Inspired by images from Young Canada, Fernwood Books created this image for the cover of Stephen Dale’s book, Noble Illusions. It is inspired by content from the Young Canada magazine. What ideas and convictions motivated the legions of young men who so eagerly headed off to the trenches of the First World War? What were the boys who stayed home told about the events of that war as the carnage escalated? And what sort of patriotic stories could be peddled after the war to youngsters who had lost fathers, uncles, brothers and neighbours mostly in Europe’s killing fields, but also in Asia, Africa and the waters between? Some answers to these questions can be found in the pages of Young Canada: An Illustrated Magazine for Boys. The National Library in Ottawa has a collection of hardbound Young Canada annuals, each consisting of over 500 small-print pages and adorned with elaborate illustrations, including various editions published between 1913 and 1920. Read in succession, they provide fascinating insight into youth culture and the tenor of the times during the confident years that anticipated the First World War, through the war years themselves, and into their sullen, sorrowful aftermath. In this short posting, I’d like to dip into the pages of Young Canada to pick up on one aspect of boys’ books of the time: the use of racist ideas as a justification for war, and the strange transformation of those ideas and their applications within this period. A fundamental idea taught to all children in the pre-war British Empire was that ‘the British race’ was inherently superior to other peoples, and that this state of affairs gave Britons a responsibility to seize control of as much of the world’s territory as possible. This idea is woven through most of the content of Young Canada but is particularly evident in “Pictures from the Book of Empire,” a series of long-form historical vignettes from the 1913 edition that recount the glorious adventures that established the British Empire. What allows Young Canada’s editors to judge Britain’s mass violence as moral, even as violence on the part of its adversaries is taken as evidence of their savagery, is the pervasive assumption of Britons’ inherent, de facto superiority over non-Europeans. This state of affairs, by extension, meant any action advancing the British cause would be defined as worthy and noble, as evidenced in the passages above. While these sorts of statements, made before the First World War, may have persuaded some Canadian boys to join the British military to help tame the world beyond Europe, the outbreak of the conflict in Europe made them more problematic: in this war, of course, the foe was white and many allies non-white. With the image of once-denigrated colonial peoples now rehabilitated, the bottom rung in the human hierarchy was vacated, to be occupied by the Germans and their allies. The target of these antipathies had changed, but the terms remained the same. Canadian boys’ understanding of world events continued to be informed by the racist ideology of the day, albeit with the characters recast in new roles to accommodate new foes. Stephen Dale is an award-winning freelance writer and the author of several books. 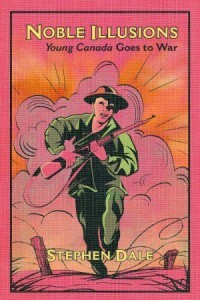 His most recent is Noble Illusions: Young Canada Goes to War (Fernwood Books, 2014).